Christmas is only a few days away. If you have yet to find the perfect gift for Krissy, Eddie or myself, here are a few last minute suggestions. True Stories from an FBI Agent Moonlighting as a Mormon Bishop. Available wherever cheesy LDS books are sold. 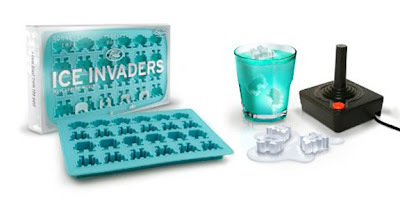 Even though there is no chance this would arrive in time for Christmas, I'll gladly take a rain check if it means getting to sip a beverage chilled by Space Invader-shaped ice cubes. An instant cure for wives with alleged bed hogging husbands. There's no way I'd come within ten feet of our bed with ol' pasty face around. We've all got fitness goals, especially right after the holidays. Krissy hopes to achieve hers by spastically swinging her legs back and forth. Pepper doesn't go all that well with Eddie's staple foods (cheese pizza, cheese quesadillas, macaroni & cheese, grilled cheese), but it would if it was freshly ground by his favorite droid. What better way to celebrate Eddie's fandom of fans and Batman than with a Batman fan? Of course, he'd probably too busy gazing at its majesty to ever sleep again. And will he be giving her the eleventy-first installment of "The Cat Who..." series? Dave would just love to cuddle up under an Edward duvet. 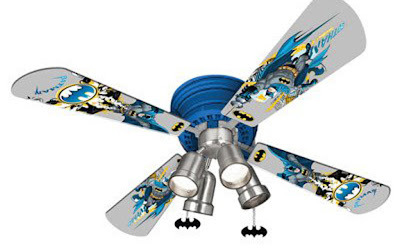 Eddie would never sleep, all night long you would here "fan", "fan" "batman ,batman"
Calvin told me that he too would also love the ceiling fan, as well as a Superman one, and a joker one, and a riddler one. So there is his last minute shopping ideas.